At first glance, infant car seats seem like multi-functional devices that can allow for safe, easy travel with a baby and, when removed from the car, can provide temporary sleeping cribs when visiting family, friends, or the office. Car seats are made for travel, though — only travel — and a recent study highlights the dangers of using them for any other purpose. Sleeping can be quite hazardous to babies less than one year old; more babies die from sleep-related causes during their first 12 months than from any other cause. For this reason, the American Academy of Pediatrics has issued repeated recommendations that all infants sleep only on a firm mattress in a crib with no fluffy, loose bedding or soft toys. Dr. Erich K. Batra, a faculty member of the Departments of Pediatrics and Family and Community Medicine at Penn State College of Medicine’s Milton S. Hershey Medical Center in Hershey, Pennsylvania, recently worked with colleagues from the Children’s National Medical Center in Washington, DC, and from the US Consumer Product Safety Commission to review the causes of deaths in children younger than 2. They used data reported to the product safety commission from April 2004 through December 2008. The reports were based on death certificates, coroner and medical examiner reports, and interviews with family members and other witnesses. The researchers discovered that all but one of 47 deaths were associated with infant car seats being used as portable cribs and from use of bouncers, slings, swings, and strollers. These 46 deaths were caused by asphyxia (loss of oxygen) due to the baby’s position within the device or strangulation by components of the carrying device itself. Almost 70% of the deaths occurred in car seats and 52% of these deaths were caused by strangulation from the seat’s straps. 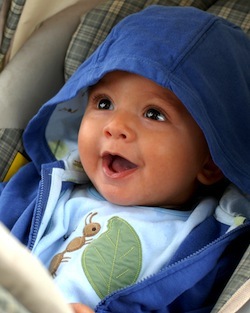 Car seats are designed to be buckled securely into the seat belts of a car. When removed from the car, the seat’s straps are loose and do not prevent the child from slipping down or forward. When a child slips downward, s/he can be strangled by the strap. When slipping forward, its neck can become bent at an angle that prevents passage of air from the baby’s nose and mouth to its lungs. The 47 deaths identified in the study occurred in babies of all ages, from infants to toddlers. The time that elapsed from the moment the child was last seen alive until it was discovered dead or in fatal distress ranged from four minutes to 11 hours. For optimum safety, Batra urges parents to put their children to sleep in properly made cribs and to use correctly fastened car seats for nothing but travel. He further recommends never leaving children unattended, whether they are asleep or awake. Use portable carrying devices according to manufacturer’s recommendations and, when carrying a child in a sling, make sure its face is “visible and kissable” at all times. Batra, Erich K., Jonathan D. Midgett, and Rachel Y. Moon. "Hazards Associated with Sitting and Carrying Devices for Children Two Years and Younger." The Journal of Pediatrics. Elsevier Inc., 27 Apr. 2015. Web. 4 May 2015. "Car seat safety: Avoid 10 common mistakes." Infant and toddler health / Mayo Clinic. Mayo Foundation for Medical Education and Research, 16 2014. Web. 4 May 2015.